According to research by Zenith International, there are a number of trends shaping the future of yogurt and related cultured dairy foods. 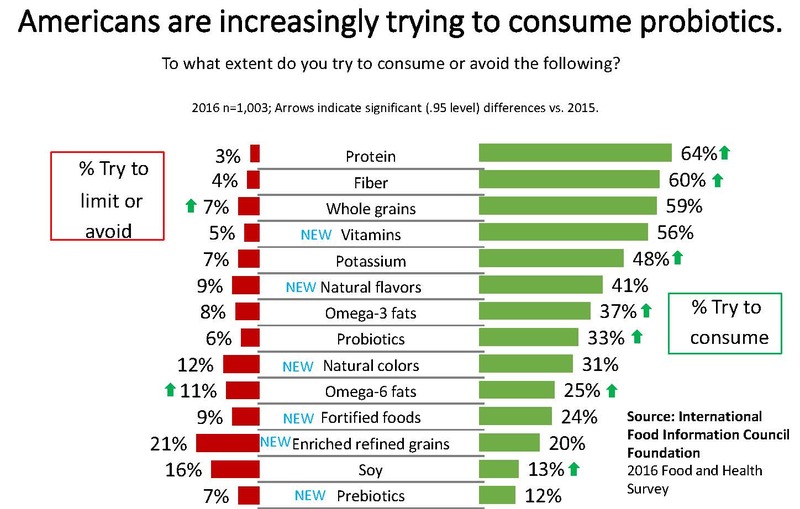 Two key drivers are probiotics and reduced/lower sugar, with the latter including growth in lactose-free formulations. In the past couple of years, there’s been an industry shift in the marketing of probiotics in dairy products. While some products do identify strain and cite clinical trials that establish a specific benefit, more products are choosing to simply market the inclusion of probiotics, which a growing number of consumers understand to have a positive effect on health and wellness. “This definition is inclusive of a broad range of microbes and applications, while capturing the essence of probiotics, which is microbial, viable and with a documented benefit to health,” says Mary Ellen Sanders, a global authority on probiotics and co-author of the consensus document. Beyond probiotics, there’s a growing global trend to formulating dairy products, most notably fluid milk, to be lactose free. This is a trend that cultured dairy foods marketers need to embrace. Lactose-free dairy products appeal to lactose-intolerant consumers, those consumers who are unable to breakdown lactose due to the body’s inability to produce any or enough of the enzyme lactase. Lactase is responsible for converting the disaccharide lactose to galactose and glucose, monosaccharides readily absorbed by the body for energy. Lactose intolerance is thought to be one of the key drivers of dairy consumers switching to alternative dairy products. To keep them in dairy, processors need to offer lactose-free products. One way to eliminate lactose is filtration technology, which requires capital investment. Another less committal option is to formulate dairy products with the lactase enzyme. The added bonus of including lactase is that processors can often reduce the amount of added sugars and still achieve the same degree of sweetness in lactose-free dairy products. This also allows for more attractive product labels with claims of reduced added sugars. The use of lactose-free claims has been rising in recent years, according to research by Innova Market Insights. In the past year, the claim was featured on 6.7% of all global dairy introductions, rising to nearly 11% in the U.S. and 8% in the E.U. Interest in lactose-free dairy products extends beyond clinically diagnosed lactose intolerant consumers. 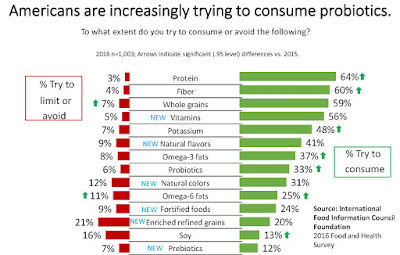 Many consumers are starting to choose lactose-free dairy products to assist with digestion. Probiotics and lactose free are complementary and make sense for dairy. To read an article I recently wrote for Food Business News entitled “Cultures and enzymes: clean-label workhorses,” link HERE. Here are some recent global innovations designed to appeal to the health- and wellness-consumer. 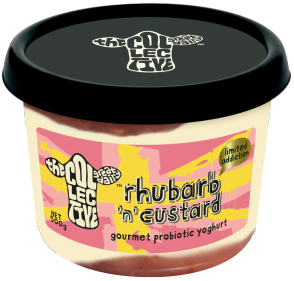 The Collective Dairy in New Zealand adds limited-edition Rhubarb ‘n’ Custard to its gourmet probiotic yogurt line made with natural ingredients. It is free from artificial additives and preservative, as well as gluten, and is described as being suitable for vegetarians. In South Africa, the Lancewood brand offers a range of cottage cheese products—smooth and chunky—that are preservative free and tout the fact that they contain probiotics. Dannon is rolling out the Activia Fruit Fusion line to the U.S. marketplace. This 1.5% milkfat probiotic yogurt is also fortified with vitamin D. Most U.S. milk processors voluntarily fortify fluid milk with vitamin D. Adding it to yogurt is not common. Dannon is changing that. 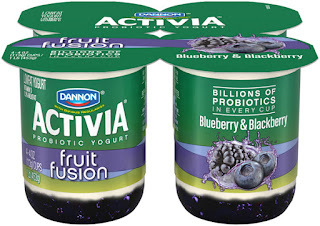 The layered Activia Fruit Fusion product comes in four varieties. They are: Blueberry & Blackberry, Cherry & Vanilla, Peach & Mango and Strawberry & Raspberry. The yogurt is sold in four packs of 4-ounce cups. In South Korea, the Yoplait brand, which has historically not touted the inclusion of probiotics or made any digestive health claims, is rolling out a product called Yoplait By Me. Managed and manufactured by Binggrae, the new cup product comes in no-sugar-added plain, as well as sweetened blueberry and peach varieties. An individual serving claims to contain 50 billion Yo Flex Creamy Lactobacillus cultures for intestinal health. Back in the U.S., noosa is introducing multiple sweet and spicy yogurt combinations. 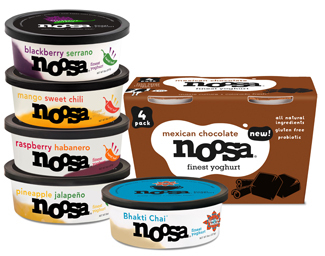 The “sweet heat” combination is an emerging trend and noosa is one of the first to experiment with it in the refrigerated yogurt category. All noosa yogurt is made in small batches on a family farm in Bellvue, Colorado, with all-natural whole milk from happy cows (not treated with rBGH), fresh fruit puree--made using the ripest, juiciest fruits--and infused with a touch of wildflower honey, and probiotics, according to the company. Six varieties rolled out last month. There are five flavors in 8-ounce cups. They are: Bhakti Chai (limited batch), Blackberry Serrano (This flavor rolled out exclusively in noosa’s home state of Colorado in January. Now it’s available nationwide. ), Mango Sweet Chili, Pineapple Jalapeno and Raspberry Habanero. The sixth flavor--Mexican Chocolate--comes in four packs of 4-ounce cups. This flavor combines cinnamon, chocolate and a pinch of chili spice. Probiotics + lactose free = innovation opportunity. “Clean label,” it was the most prominent theme at IFT16, the annual meeting and food expo of the Institute of Food Technologists held in Chicago this past July. 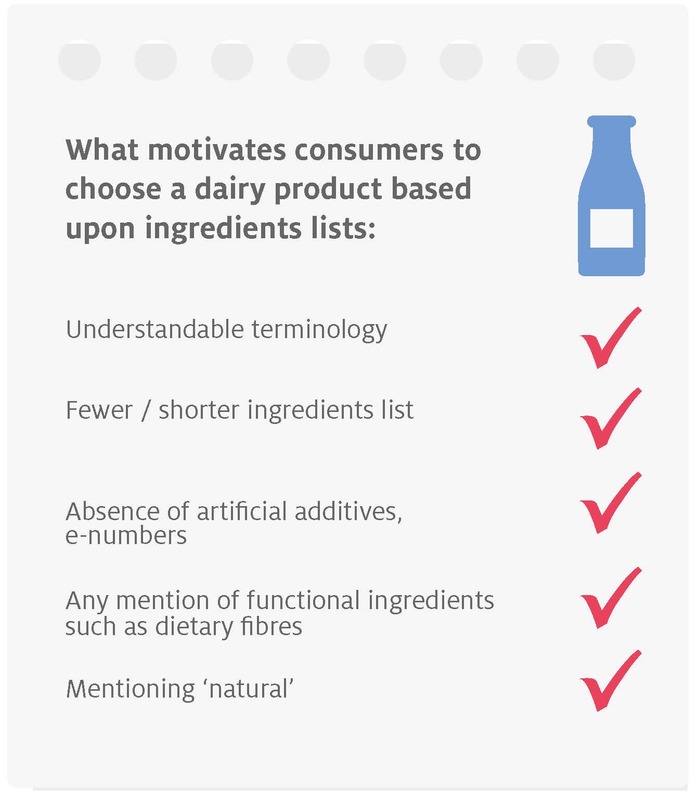 And no wonder, did you know that 73% of consumers find it important that they recognize a product’s ingredients? 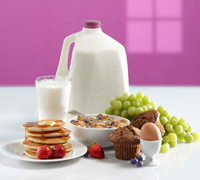 When it comes to clean label, dairy foods dominate the packaged foods sector. With minimal processing along with the addition of just a handful of ingredients, fluid milk may be converted into many different products, from cheese to ice cream to yogurt. 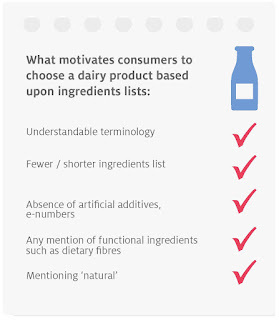 Dairy foods, by design, should be clean and simple. 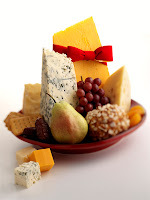 Take cheese for example, most natural cheeses are made with four simple ingredients: milk, cultures, enzymes and salt. 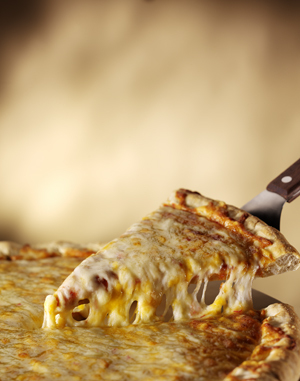 It’s the exact same ingredient statement for cheddar, mozzarella and Parmesan. It’s the specific selection of milk, cultures, enzymes and even salt, that influences flavor, texture and appearance. To read more about cultures and enzymes as the clean-label powerhouses behind dairy foods innovations, link HERE to an article I recently wrote for Food Business News on the topic. There’s an incredible opportunity to get creative with cheese when you formulate non-standardized products, some of which are considered to be “process” cheese. I’m not talking the individually plastic-wrapped slices that often top a burger. Rather, many non-standardized cheeses encompass a range of premium, gourmet products that might contain a few more than those four simple ingredients, but they can be clean and simple ingredients nonetheless. Process cheeses, as well as non-standardized cheeses, can serves as a base for innovative dairy foods formulators to add layers of flavors. 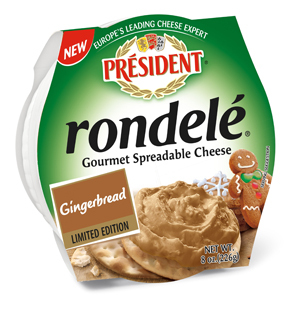 Take for example this new gourmet spreadable cheese product from Lactalis American Group Inc. President Rondele Gingerbread cheese will be available from October 1 through December 31. This is the company’s first-ever, limited-time seasonal flavor. This spreadable cheese with a cookie-inspired flavor, features hints of molasses and ginger. It comes in an attractive disposable cup that resembles a white ramekin and can easily be placed right on the table for a convenient presentation. Most natural cheeses, which are living systems that evolve over time in terms of flavor and texture, are made from only four ingredients: cultures, enzymes, milk and salt. In Title 21 Part 133 of the Code of Federal Regulations (CFR), FDA legally defines cheese and outlines the requirements for more than 90 standardized cheeses, including natural varieties such as cheddar and mozzarella, as well as various process cheeses, including those that undergo heat treatment as well as those comminuted without the aid of heat. 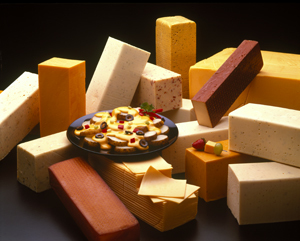 The CFR provides a number of standards for pasteurized cheese based on total cheese solids content. 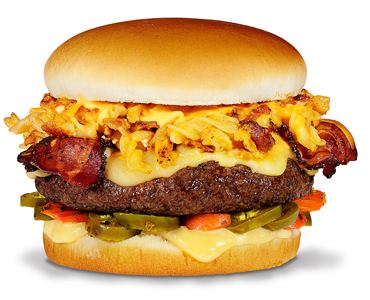 This includes pasteurized process cheese, pasteurized process cheese food and pasteurized process cheese spread. Cold-pack and club cheese are also considered by many as process cheeses. These products are comminuted without the aid of heat. Free from additives: remove or replace food additives. Feature a simple ingredient listing: choose recognizable ingredients that do not sound chemical or artificial. Minimally processed: process foods using traditional techniques that are understood by consumers and not perceived as being artificial. 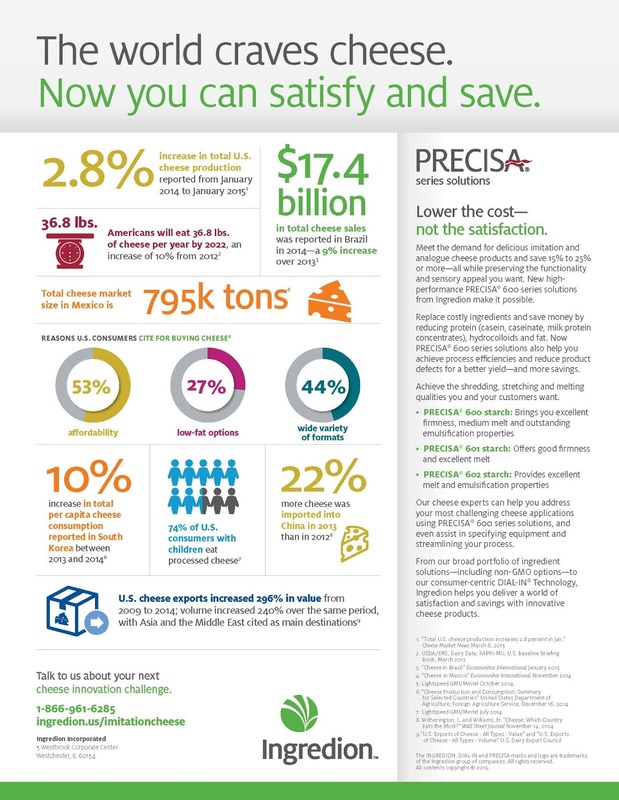 Today’s consumers want convenience foods and beverages with no compromise. They should taste great and use only ingredients that they understand, recognize, trust and like. Clean-label formulating efforts balance rising concerns about what goes into a food product and the negative perception of highly processed foods. Following widely covered news reports of adulteration and fraud in some sectors of Italian cheese, a leading company in the U.S. cheese industry, Schuman Cheese, announced in early August 2016 plans to introduce the industry’s first trust mark. The on-package seal is intended to verify product quality and manufacturing integrity. The True Cheese trust mark will appear on Schuman cheeses and snacks sold in supermarket and mass retail channels. The company reported newly labeled products are already appearing in some stores and will be phased in as customer orders are filled. The announcement follows recent news reports of an investigation of Castle Cheese Inc., by the FDA. According to the report, Castle’s grated cheese was labeled as “100% Parmesan Cheese,” yet it contained no Parmesan cheese, a standardized product. The first quality seal of its kind in the cheese business, the move follows similar food industry initiatives for olive oil, honey and fresh fish, intended to help consumers know the product they are purchasing is real, and indeed what it claims to be. 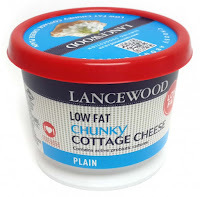 The True Cheese label will mean the verified product is made only with milk, cultures, salt, enzymes, is aged as required, and that any use of an anti-caking ingredient is at or below industry accepted levels and properly labeled. Schuman Cheese also announced a product testing agreement with Covance Food Solutions to independently test True Cheese labeled products. Periodic testing of randomly selected products taken from retail locations will be performed at Covance’s laboratory in Madison, WI. According to the company, apart from the seal and related testing of items displaying the mark, there’s no real way for consumers to self-determine exactly how a cheese is made or if excessive fillers might be included in the package. To learn more, link HERE. Pictured here is a yogurt case in a Western Michigan beach town, a community of less than 2,000 households and home to four supermarkets. This is quite the impressive spread with many varied options. Granted, during the summer months (I took the picture yesterday), the population of this town jumps from about 5,000 to 20,000, and product moves off the shelf fast. But what is to be noted is that the size of this yogurt case has not changed in the past two years. Winter, spring, summer or fall, it holds a lot of SKUs. 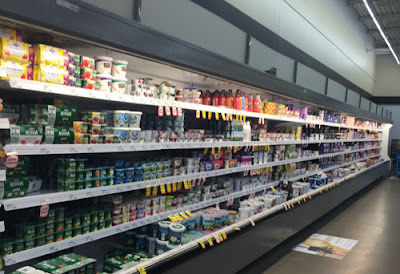 What has changed in the past two years is the yogurt case’s composition, as this retailer continuously brings in new products and uses shelf tags to flag them. If they sell, they stay. If they don’t, room is made for something else new. And just yesterday while visiting the story, it was very noticeable that Greek yogurt no longer jumps out at you. 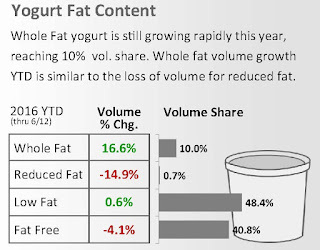 According to data from IRI provided to Dairy Management Inc., and courtesy of the Midwest Dairy Association, Greek currently maintains 38% share of volume sales of refrigerated yogurt. 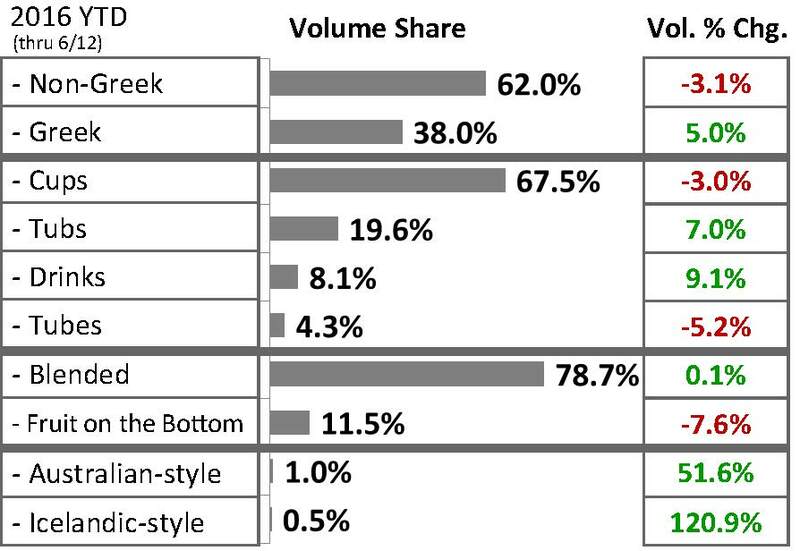 Non-Greek is the remaining 62%, with sales declining. However, I believe the non-Greek players (many of them are active in the Greek segment, yet believe in the power of their core yogurt franchise) are actively fighting back to regain control. Let’s look at Dannon, the nation’s leading yogurt maker. Just a month ago, the company announced that in response to evolving consumer preferences, it is implementing the first of many major changes to provide more choice to consumers. To start, Dannon and Oikos branded products now include options labeled as being made with non-GMO ingredients. Additionally, starting now and expected to be completed within several months, all Dannon products in the U.S. that have GMO ingredients will be clearly labeled as such. Further, starting in 2017 and completing the transformation by the end of 2018, Dannon will go one step further to ensure that the cows that supply Dannon’s milk for the company’s three flagship brands (Dannon, Danimals and Oikos) will be fed non-GMO feed, a first for a leading non-organic yogurt maker. This will involve the conversion of an estimated 80,000 acres of farmland to produce non-GMO crops. This transparency includes clear packaging to see what’s inside. That’s what you get with the company’s new Activia Fruit Fusion line. This 1.5% milkfat probiotic yogurt is also fortified with a nutrient of concern: vitamin D. Most U.S. milk processors voluntarily fortify fluid milk with vitamin D. Adding it to yogurt is not common. Dannon is changing that. The layered Activia Fruit Fusion product comes in four varieties. They are: Blueberry & Blackberry, Cherry & Vanilla, Peach & Mango and Strawberry & Raspberry. The yogurt is sold in four packs of 4-ounce cups. 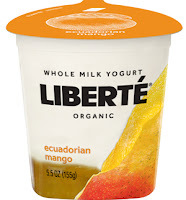 The company is also jumping on the whole milk yogurt bandwagon. 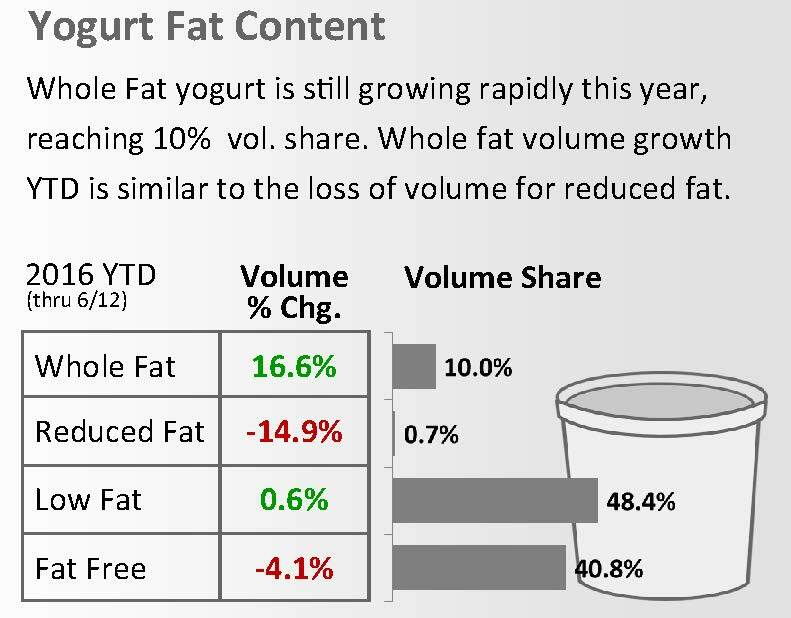 According to IRI data, whole milk yogurt is growing rapidly and currently has 10% volume share. (See graph.) 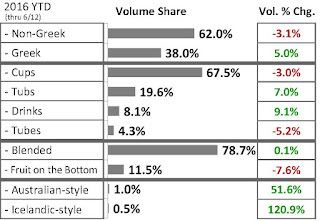 Consumers are embracing the deliciousness and nutrient density of whole milk yogurt and it shows in sales and the number of products entering the category. 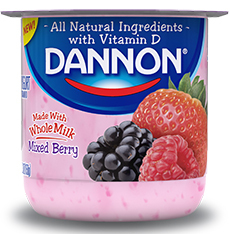 Dannon’s new whole milk offering is a blended product made with all-natural, non-GMO ingredients and fortified with vitamin D. The 5.3-ounce cups come in eight flavors. They are: Blueberry, Cherry, Mixed Berry, Peach, Raspberry, Strawberry, Strawberry Banana and Vanilla. Each single serving contains 140 calories, 4.5 grams of fat, 5 grams of protein and 15 to 16 grams of sugar. Another area of activity is in yogurt drinks. I’ve commented on this segment numerous times throughout the years. In the past, it seemed as if all the major brands rolled out a drinkable yogurt at the same time and because U.S. consumers were not all on board, sales expectation were not met and the brands pulled out. Might the time finally be right for drinkable yogurt? Dannon is now serving up two drinkable product lines designed for adult palates. Dannon Dairy Drink, a cultured milk formally sold exclusively through foodservice channels, is making its way into the retail sector. The 7-ounce bottles come in flavors that have a Hispanic-flavor edge to them, with the goal of attracting this demographic who has long been drinking yogurt, more so than spooning it. The flavors are: Mango, Peach, Pecan, Pina Colada, Strawberry and Strawberry Banana. There’s also a new drinkable yogurt under the Oikos brand. Oikos Yogurt Drink contains no fat, no added sugar and no artificial sweetener. It is sweetened with stevia, gets a boost of protein from milk protein concentrate and is a source of another nutrient of concern—fiber—thanks to the addition of chicory root fiber. Interestingly, the Oikos brand is all about “Greek,” yet the packaging does not promote the product as such. Each 7-ounce bottle contains 110 calories, 11 grams of inherent sugar, 10 grams of protein and 4 grams of fiber. He told investors that the company is planning to “renovate” 60% of the company’s yogurt business within the next year. This includes reinventing the company’s flagship Yoplait brand, as well as growing its Annie’s and Liberté offerings. Many of these new products complement the growing whole milk category. 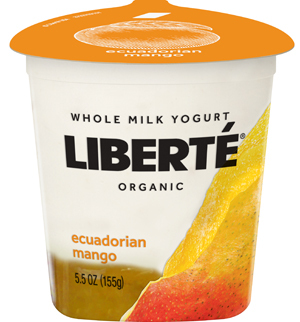 For example, the Liberté brand now includes eight varieties of whole milk yogurt, including one unflavored variety. The Sweet Cream offering starts with pure, organic whole milk, sourced from a co-operative of family farms. It’s then lightly sweetened with organic cane sugar. A 5.5-ounce cup contains 190 calories, 13 grams of fat and 5 grams of protein. To read a Fortune article on General Mills’ plan to renovate its yogurt offerings, link HERE. Another comprehensive article was published in Food Business News. Link HERE to read it. To appeal to youngsters, the company has aggressive plans for its recently acquired Annie’s brand. 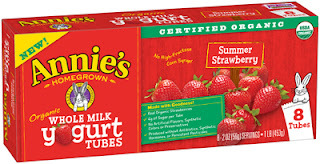 At the beginning of this year, General Mills introduced Annie’s Organic Whole Milk Yogurt. Sold in four-packs of 4-ounce cups, the yogurt comes in three varieties: Berry Patch, Summer Strawberry and Very Vanilla. 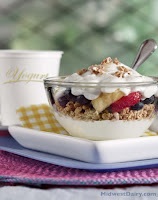 The probiotic yogurt is described as being sweetened with organic fruit and a touch of cane sugar. 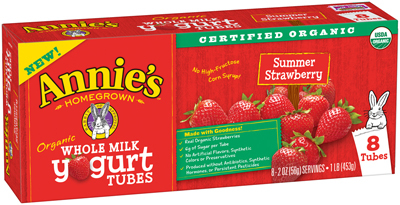 More recently, the company added 32-ounce tubs of Plain, Summer Strawberry and Vanilla whole milk yogurt to the Annie’s brand. There’s also eight-packs of 2-ounce tubes. The three varieties are: Berry Patch, Strawberry Banana and Summer Strawberry. To appeal to older kids and adults, the company has plans to enter the yogurt-based smoothies sector, too. 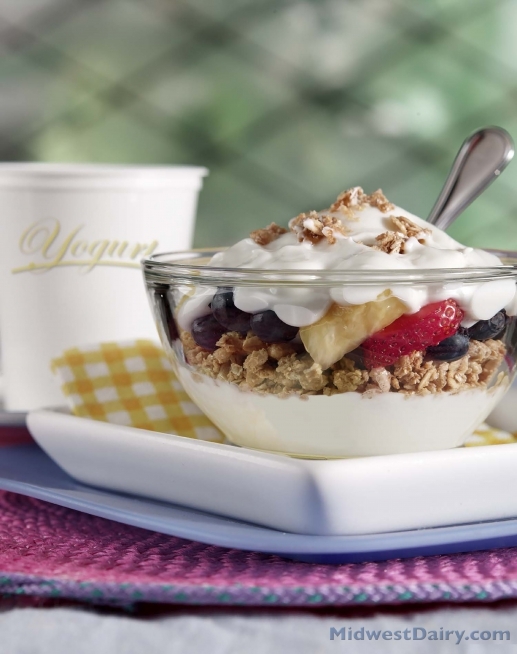 “We’ll introduce several Yoplait yogurt beverages in cities with large Hispanic populations,” Harmening told investors. And because toddlers who grew up on tube yogurts continue to enjoy the interactivity of squeezing yogurt into their mouth (and probably on their siblings), the company now offers Yoplait Go Big. These 4-ounce tubes of low-fat, vitamin D-fortified yogurt come in four varieties. They are: Cherry, Mango, Mixed Berry and Strawberry. What else is trending? It’s grass-fed milk yogurt. Though still a small niche, a number of brands are trying to differentiate through the use of milk from grass-fed cows. 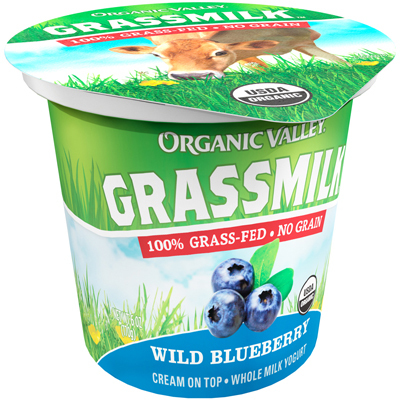 Organic Valley has started offering 6-ounce cups of grassmilk yogurt in four varieties. They are: Plain, Strawberry, Vanilla and Wild Blueberry. 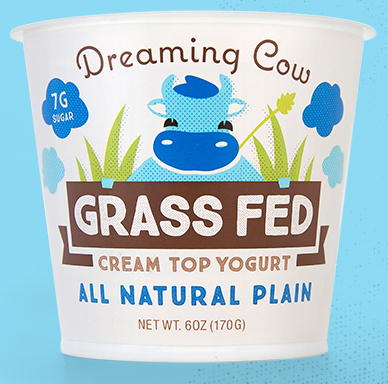 Dreaming Cow has redesigned its package to emphasize the grass-fed cows milk message. The whole milk, cream top yogurt now comes in eight dreamy flavors. They are: Blueberry Cardamom, Dark Cherry Chai, Honey Pear, Maple Ginger, Peach Mango, Plain, Strawberry Pomegranate and Vanilla Agave. 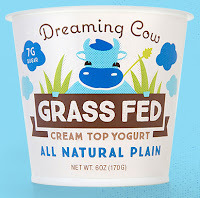 Dreaming Cows reside in Jumping Gully Dairy, one of three family-owned, grass-based, New Zealand-style rotational grazing dairies in Southern Georgia, according to the company. The climate here allows the cows to graze year round on lush green pastures, producing milk with a distinct taste that is naturally higher in healthful fatty acids, including omega-3s and conjugated linoleic acid. I think you will agree that the refrigerated yogurt case is undergoing a major transformation. The focus is on simplicity and back to nature, with a delicious twist on flavors. And, of course, protein remains a focus in the yogurt case. 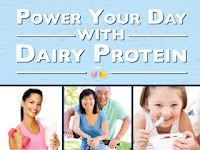 The Midwest Dairy Association is offering dairy foods processors, marketers and educators use of its Power of Dairy Protein online communications toolkit to help educate consumers about the importance of including 25 to 30 grams of protein in every meal, including breakfast, for best performance at school, at the office or during your daily activities. Link HERE. This communications kit includes a variety of tools, including a customizable news release/newsletter article, blog postings, protein-related FAQs, recipes and recipe videos and suggested social media posts that can be customized for varied communications channels now and throughout the year. Thanks to my friends at Midwest Dairy, who explain in the toolkit that yogurt is a flexible nutrient powerhouse that knocks out hunger throughout the day. It is extremely versatile and a smart choice for quick and easy meals and snacks, as well as a healthful base ingredient for making dips, sauces and smoothies. Yogurt is an excellent source of calcium and potassium and provides numerous vitamins and minerals. What’s more, research shows kids who eat yogurt have improved nutrition and weight status. Startups must decide whether they want to invest in processing, packaging and warehousing (to have control over the operation as well as secure any proprietary technology) or to partner with a contract manufacturer, a.k.a. a co-packer. More time than not, entrepreneurs and smaller manufacturers choose to partner with an expert to manufacture their products. There are many reasons why this is the smarter option.